I can't have candy, unless I've never tried it before and it's a review for this blog. And it's on sale. And last week, the coconut M&Ms were 2/$1 at Kroger. I had been avoiding them for a while. I'm not a big fan of coconut and I just couldn't even figure out how M&Ms could possibly taste coconut successfully. I think I'll have to try this Chocolate Coconut M&M Cookie recipe and report back! I love chocolate-covered pretzels, so I was looking forward to trying these. But it's not a similar experience at all. It's more of a malted-milk ball taste with a salty afterbite (rather than a sweet). And I'm not a malted milk ball fan, so needless to say... I will be reserving my chocolate calories for my plain and/or peanut M&M's! Now put a candy-coated shell on a chocolate-covered pretzel... I'm in! Nascar Nextel Cup driver Dale Jr. recently launched a new candy bar, Dale Jr.'s Big Mo', through R.M. Palmer Company. The name Big Mo' is a play-off of Earnhardt Jr.'s hometown of Mooresville, N.C., and the longtime moniker used for him and his closest friends, the Dirty Mo' Posse. The candy bar will come in two flavors - creamy caramel and peanut butter. It is scheduled to hit stores in January. 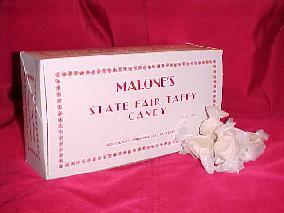 Malone's State Fair Taffy - as sold at the Mississippi State Fair each year - can be shipped out of town for Christmas. (And they ship just about anywhere.) You can get a 1-pound bucket for $18 or three for $50, including tax and shipping. Boxes (shown above) are $12. For more information, call Abby Malone at (601) 238-4115. Get your orders in by Dec. 15th to insure Christmas delivery! I saw these in the grocery store and being the dark-chocolate fan I am, I just had to try it. 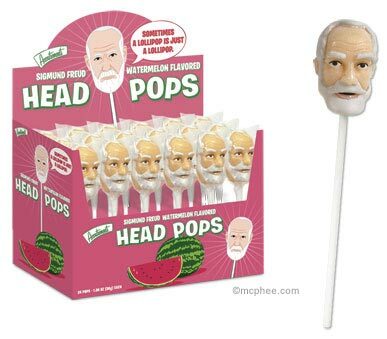 It's odd, because when you first pop them in your mouth you think, "What's so different about this than the other?" But the more you eat, the more you can see the difference - and the better they taste. 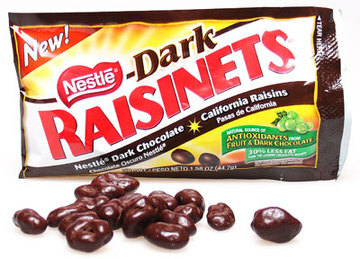 They seem to have a bit more chocolate on them than the regular Raisinets to me. The Candy Blog says it is not really dark chocolate but darker milk chocolate - but they taste great regardless. I'm a big Nestle Crunch fan. I like the original. I like the white chocolate. I like the mini pieces. And the Nestle Crunch with Caramel bars were on sale for 25 cents each at Kroger - so I decided to try it. The caramel and the crunch just don't go together. It's not a nougat-y caramel - it's the runny, liquid kind. And there's just no reason for it to be there. Or as an ex-boyfriend of mine used to say all the time, "If it ain't broke, don't fix it." When I took Quentin to see The Ant Bully in Orlando, I got my usual kids' movie deal. But they had an unusual candy treat tucked inside - unusual in Mississippi, at least...Jolly Rancher Rocks. Only 120 calories in a container too. Not bad.